As you will see from our website, at eC02 Greetings, we try to aim for a large variety of business holiday ecards for our customers to choose from. This design, as you can see is one of our humorous ecard designs and is very popular with our customers! The electronic christmas cards for business clearly demonstrates a stunning beach background and is very tropical with the beautiful plantation and trees in the background. You almost get the feeling this is a secluded beach somewhere incredible. Therefore, this would be ideal if yourself or your clients travelled for business. Many of our business clientele who choose this ecard are actually from warmer climates e.g. Florida / Hawaii so this design lends itself to sending a more appropriate message to your local audience. Alternatively you may be a company that is based overseas or you just simply like to embrace the idea of a warm, sun filled paradise Christmas this year. 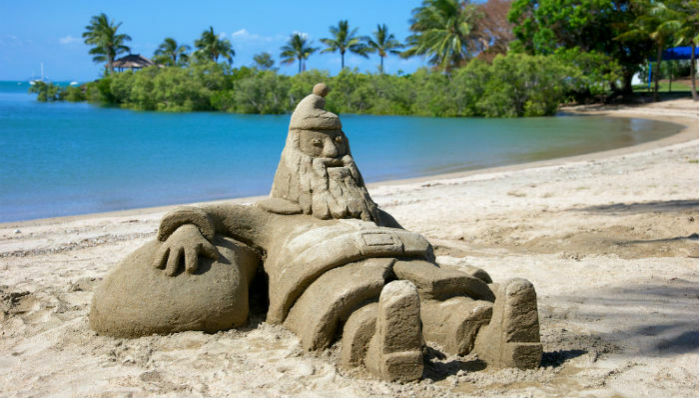 In addition to a mesmerising beach background, the humour comes into the card with the large sand mould of Santa himself with his large sack of presents! The Santa looks like he’s enjoying a well-deserved holiday on a beautiful tropical island. This is bound to put a smile on any business customers face if they are having a long day!